Kevin Oliver, director of Washington NORML, calls Initiative 502 a “baby step” toward full marijuana legalization. Under a hot weekend sun, volunteers stood between the county Democrats’ booth and the Republicans’ with a table full of stickers and pamphlets. It was Pig Out in the Park, where many people were looking to avoid politics, but the green logo with a pot leaf in the center of the sticker made some take a second look. 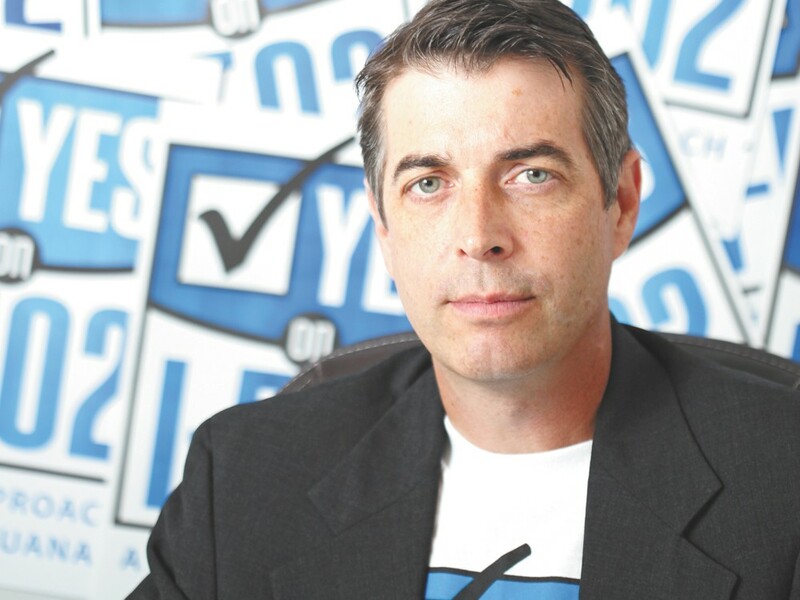 “Younger voters would pass the gauntlet of people with clipboards, ignore them and then see our booth and come register to vote,” says Kevin Oliver, director of the Washington affiliate of the National Organization for the Reform of Marijuana Laws, or NORML, which ran the booth. Oliver is Spokane’s only full-time advocate behind what could be Washington’s most ambitious step in marijuana law reform. The national arm of NORML endorsed Initiative 502 in February, and Oliver has since been trying to drum up support across the state. He says the effort is energizing people otherwise apathetic to politics. But it’s also alienating some of the legalization movement’s strongest supporters: medical marijuana patients who worry the law’s DUI provisions would snare regular users with higher tolerances. Jeffrey Steinborn is a Seattle defense attorney who supports full repeal of marijuana prohibition, and says he’s been handling marijuana possession cases since 1968. He predicts that Initiative 502 will pass, but that the federal government will use its power to quash the legalization part of the new law and leave only the DUI provisions. If passed, Initiative 502 would make the possession of one ounce of marijuana legal in the state of Washington for people 21 and older. The law includes a licensing system for growers and sellers and would establish a 25 percent tax on marijuana. It would also establish a 5 nanogram limit for active THC, the psychoactive component in marijuana, while driving. “We really tried to build in as much structure and control as possible, so voters could be more comfortable legalizing,” says Alison Holcomb, director of the group behind I-502, New Approach Washington. Washington’s last serious consideration of marijuana legalization was in 2010. That year, two bills — one to legalize and one to decriminalize — failed in the Legislature, and an initiative to remove all state laws prohibiting marijuana possession failed to get enough signatures make it on the ballot. This effort started last fall and gathered 350,000 signatures by the year’s end, qualifying for the ballot. Since then, New Approach Washington has raised $3 million and added powerful names like Seattle City Attorney Pete Holmes, former United States attorney John McKay and all nine Seattle City Council members to its list of supporters. East-side support is more sparse. City Council President Ben Stuckart, former director of the Spokane Regional Health District Kim Marie Thorburn and state Sen. Lisa Brown, D-Spokane, have said they support the initiative. But according to the state Public Disclosure Commission, just five gifts to New Approach — a total $155 — came from Spokane addresses. I- 502’s most obvious hurdle is that it flies in the face of federal law, much the same way medical marijuana legislation does. No one knows exactly how federal agents and prosecutors could react to the passage of I-502, especially after federal agents raided medical marijuana dispensaries in Spokane, Tacoma and Seattle last year. Holcomb says those raids were of dispensaries that were breaking their state’s medical marijuana law, not just the federal ban on all marijuana, so she’s confident the feds would allow 502 if sellers complied with it. Michael Ormsby, the U.S. attorney for Eastern Washington, declined to comment for this story through an aide, who said Department of Justice policy prohibits employees from commenting on pending legislation. Worries that the feds would overrule the law are rooted in the fear of what could be left standing: its DUI provision. Medical marijuana advocates argue that everyday users have a higher tolerance than recreational users and could be above the law’s 5 nanogram limit without being impaired. The limit is of active THC, not carboxy-THC (which shows up days or weeks after use on workplace drug tests, for example), but research shows that active THC can linger too. The fight is a microcosm of the larger debate over marijuana legalization. In a movement of people who all want marijuana legalized, there’s a chasm over how to get there. Some insist on first repealing all laws that make marijuana illegal, the same way Prohibition ended. Others support the compromise 502 has struck. The public may indeed be ready for a change. The initiative has 55 percent support across the state, according to a 630-voter poll sponsored by Survey USA and KING-TV in Seattle. New Approach has done internal polling and, while Holcomb refused to give specific numbers, she says those polls are producing about the same results as the Survey USA poll. Oregon and Colorado are also considering pot legalization initiatives this year, but Oliver, from NORML, says eyes are on Washington because of 502’s built-in taxation and regulation.